I love the poetry in these inverted glass jar found terrariums, depicted in a tutorial by Amy Merrick on Design Sponge. I think these would make great centerpieces for an event but I sincerely doubt they would live very long in such an enclosed environment sans air circulation. 1. 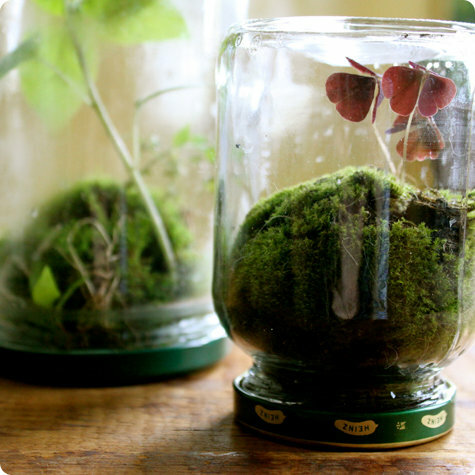 Use a drop of bleach when rinsing out containers before use for a terrarium. And make sure they are bone dry when you start planting them. A. Rinse newly harvested moss with fresh water, press lightly on the wet moss to locate pests, trash or unwanted plants in the chunks. B. Quarantine rinsed and dried (as in not soaking wet any longer) moss in a "holding tank" for 1-2 weeks so you can watch out for the development of mold. This can be a dish with a lid partially covering it or a ziplock bag 2/3 sealed shut with a damp paper towel for the moss to rest upon. For more about washing moss see my earlier post here on the prevention of disease and pests in terraria.